and your customers will thank you! Get more clients with marketable data! Use Television marketing to reach out to customers and increase sales. 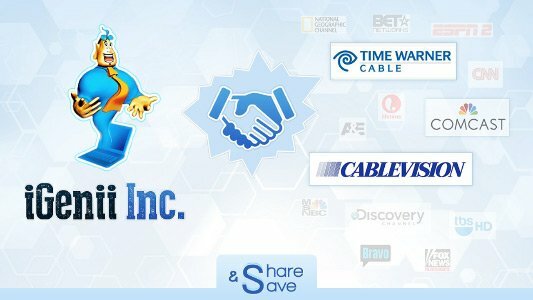 iGenii Inc. has reached an agreement with a television advertising company enabling us to provide deeply discounted rates for 60 second television advertisements. The television commercials will run in 13 week cycles, on three major cable providers and on 25 of the most popular channels. Three to four participating brands will be invited to engage in a collaborative television campaign. The fees and exposure times will be equally divided and the average cost per 60 second commercial is estimated to be $20 per brand plus the cost of creating the commercial. In combination with iShare&Save each brand will have their Big Data information saved onto the Big Data cloud account which they can share for cross selling purposes. Reach your customers from many angles with iShare&Save! We envision a successful and affordable marketing campaign that will reach your new customers from many angles.